Verna Vogt age 99, went home for Christmas! 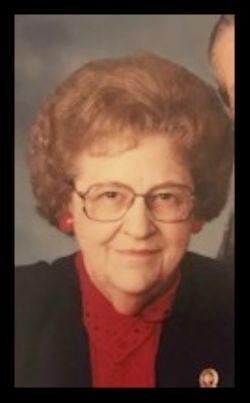 Verna passed away on December 21, 2018, in Ozark, Missouri, where she had lived for the past two years. Verna was a beloved wife, mother, grandmother and great-grandmother. Verna was born to Ed A. and Ida Stork on January 14, 1919. She grew up on a farm in the Orum, Nebraska area. She married Perry Toebben on June 9, 1940. To this marriage 2 children were born – Bob and Karen. After Perry passed away in 1971, she continued working on the farm and found love again and married Ernie Vogt on July 18, 1975. After years on the farm, Verna and her husband, Ernie, eventually moved to the town of Arlington. Verna was a life-long member of her beloved St. Paul’s Lutheran Church. Verna lived to serve her family, her church and her community. She is survived by: her children, Karen (Bob) Biache of Ozark, Missouri, and Bob (Donna) Toebben of Blair; 5 grandchildren, Dan (Karen) Toebben of Blair, Tom (Stefani) Toebben of Blair, Bobby Biache of Springfield, Missouri, Wendy (Matthew) Dawson of Peoria, Illinois, Debbi (Buddy) Bailey of Ozark, Missouri; and 9 great-grandchildren, Austin, Zach, Josh, and Mikaela Toebben; Tiffani and Trevor Toebben; Brinkley and Drake Sonntag; and Toebben Grace Dawson. Verna is preceded in death by her parents, three brothers, and two wonderful husbands. Funeral services will be held on Saturday, December 29, 2018, at 11:00 a.m. at St. Paul’s Lutheran Church in Arlington with the committal and lunch to follow. Visitation will be Friday at the Ludvigsen Mortuary Chapel in Fremont from 5-7 p.m. Memorials may be made to St. Paul’s Lutheran Church.